Our large four bedroom four bath townhouse is 400 yards (metres) from the main ski run. Newly, renovated with high standard fittings and 1930 square feet of space (180 square metres), our townhouse provides comfortable accommodation for 8 people. One of our recent guests, in his review, said that "the contemporary finishes made us feel like we were in a 5 star hotel." Another comment was, "Tom's place looks exactly as pictured - stylish, uncluttered, modern and sleek." Our walking distance location and free shuttle bus add convenience. High vaulted ceilings planked with cedar and high windows create an airy feeling and are open to Whistler Valley views. The main floor bedroom has a king sized bed and the other bedroom has two single beds. Upstairs is a lounge and a bedroom with a king sized bed. There is also a sleeping loft bedroom upstairs. Our underground and secured parking garage has accommodation for two cars. The private entrance at ground level leads to the landscaped grounds. -Watch your favourite shows on Netflix. -Every 10 minutes a free shuttle bus takes you to Whistler attractions. - Bedrooms number one and number three are master bedrooms, each with a full ensuite and each with a king sized bed. Often, the bedroom arrangements of our townhouse make it possible for two families and their children to travel together to Whistler. - We have two bedrooms with single beds. Bedroom number two is a full sized bedroom with normal twin beds. On request, the twin beds can be joined to make a king bed. Bedroom number four is a small loft that could accommodate two small children on separate beds. Alternately, bedroom four can convert to a room with one bed, adequate for an adult. - There is also a sofa bed in the upper lounge. At Whistler, we love having the great opportunities to ski, hike, bike, golf, swim and yet, be able to go to great restaurants and events in the village. It's a pleasure for us to see our guests have a great time at Whistler. We chose this location because it is walking distance to most things and, yet; it is still a quiet area. It's close to the village but not in the night time noise of the village centre. We find that once we arrive, we don't use our car very often. All bathrooms and bedroom have been completely renovated and enlarged. All bathrooms have heated floors. We are walking distance to Whistler Village. Alternately, a free shuttle bus will take you to the village. Take the free bus or walk to Lost Lake and Lost Lake Park. There are trails for walking, bicycles, and cross country skiing. Lost Lake's sandy beach is popular for swimming in summer. We usually walk to ski, about 400 metres. However, you can also use trails to ski to the ski runs. Alternately, a free shuttle bus to both Blackcomb and Whistler Mountain goes every 10 minutes. Local calls are free; long distance is free within Canada. 5 cents per minute to the UK and most of Europe. 6 cents per minute to Australia. Our central heating has individual thermostats in each room. Additional maid service can be arranged by request. Full size high efficiency top loading washing machine is in the separate laundry room. Full size dryer is in the separate laundry room. The gas fireplace has a safety screen and is completely sealed from the townhouse. The fireplace is efficient. It has its own air supply and a separate air duct system for heating the townhouse. Two secured underground parking spots are exclusive to our unit. 600 Mbps download and 20 Mbps upload. Skype audio and video work well at our high speeds. We subscribe to Netflix so that you can watch movies and television shows on demand. Separate towels are also provided for the hot tub. We also have ethernet outlets. Our internet provides download speeds of 600 mbps and upload speeds of 20 mbps. Each TV is connected to the ethernet. 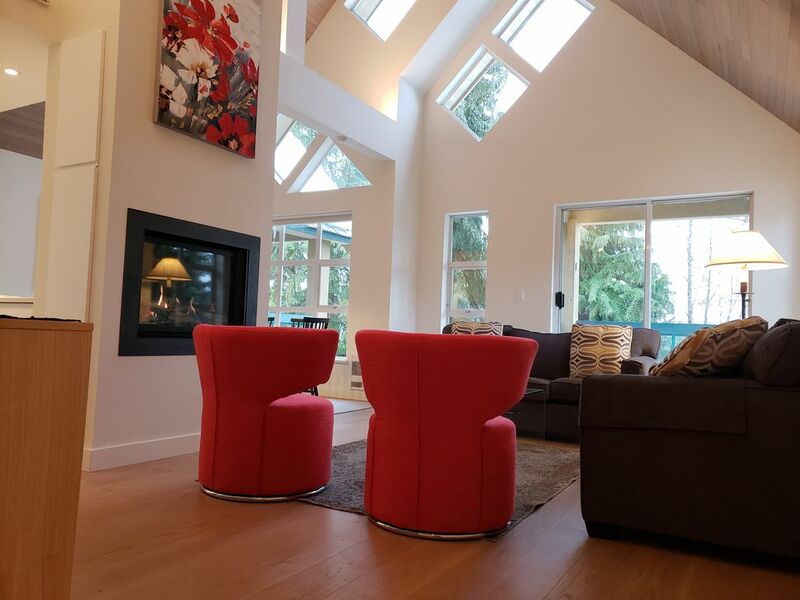 The living room is bright with vaulted cedar plank ceilings and has views to forests and mountains. full size refrigerator and freezer. The kitchen has a full sized stove. It's a four burner smooth top with a full sized oven. There is a cone filter coffee maker, an espresso machine and a bean grinder. coffee, tea, cooking oil, sugar and other ingredients are provided. The kitchen is fully equipped with cooking utensils, pots, pans, and spices. Large kitchen has an island and is fully equipped for cooking. A wide variety of spices are provided. Dine with views to forests and mountains. We have cable TV and we also have streaming video service for Netflix. Our fast ethernet system streams 4k video content to the TV's easily. We have four 4k OLED TV's. Four 4k OLED TV's with cable and Netflix in living room (65") and in the lounge room (55") with PVR and in the two master bedrooms (55"). The upper lounge has a 5.1 sound system connected to the TV in a home theatre arrangement. Mountain views are seen from the balconies There are two main floor balconies; one is beside the living room and the other is beside the bed rooms. In season, outdoor furniture is provided. Whistler has several lakes and a quiet river suitable for canoes and kayaks. There are three balconies. The two main floor balconies have chairs and tables for lounging in summer. The upper floor bedroom has a small juliet style balcony and that provides views and fresh air. The Chateau Whistler Golf Course is 300 metres walk away. Stayed here for a week with 2 families of 4. Plenty of room for everyone. Very high end finishes. Heated floors in all bathrooms and even laundry room. Upstairs bedroom is very small with a twin and trundle, and not much space. But, queen sleeper sofa in upstairs den worked great. All other bedrooms are very spacious. 4 full baths accommodated everyone. Tried to ski out, but trail goes uphill at points and crosses the street, so it was easier to walk (about 10 mins) or ride the bus which drops off right out front. Never tried to ski in, but looks like it would involve walking and removing skiis as well. Convenient to everything. Would highly recommend! We just returned from our 6-night stay in Whistler. We had our extended family along (3 kids, 5 adults) and the condo was a great fit - we used all 4 bedrooms along with the sofa bed in the upstairs landing for the third kid. The property was recently renovated and everything is exceptionally well done. Tom, the host, was super helpful and responsive throughout the process and in many years of ski vacations, we have never had a more well-stocked condo. In terms of constructive feedback, the only thing from our family is that most of the mattresses were very firm - the pickiest sleepers took the room with the twin beds which were softer and we all made out ok. The location is pretty convenient. The #5 bus stop is right at the end of the driveway which runs to both base areas (and the village). As for ski-in/ski-out, it took us a little experimentation and technically it's ski-walk-ski both going and coming, but overall still fairly easy to access Blackcomb base. You can exit through the parking garage to a trail that will head across Spearhead Dr and then down a long-ish traverse to the base. For the way back, there is a similar path that starts just below the cedar creek condos (and maybe 20-30 yds uphill from the path down to the slopes). Ski that as far as you can - you will end up skirting Spearhead Pl and have to stop and take your skis off where it joins Spearhead Dr. Walk diagonally across Spearhead Dr towards the bus stop and you should see one of the blue trail signs nearby. This will take you straight back to where you started - the way back in is actually easier than the way out with very little poling required. It was a pleasure to host this lovely family in our townhouse. The detailed observations were appreciated; they painted a useful picture for future guests. We look forward to welcoming this family again. We spent 6 nights at this property during a skiing vacation. Although we were new to the Whistler area, the Upper Village where the property is located seemed to be the place to be, as with the new Blackcomb gondola, it was a much quicker way up the mountain in the morning. The property itself is exceptional. In 30 years of going to various areas and renting various properties, this one was the most well-stocked ever. Enough dishes, utensils, and anything else for a large party. 4 bedrooms, each with their own bathroom made it much easier than a situation where everybody is fighting over a hot shower at the end of a long day. Tom, the host, made the experience go without a hitch. From directions on how to get from the airport to a multi-page introduction to the property and the Whistler area went well beyond what one expects. Finally, although we had a car, we found the bus, which stopped right outside the unit, to be a fast and convenient way to get around. No need for a car, as the major parts of the Whistler village and the Upper Village are just minutes away. Superb, state of the art accommodation! Everything you need is there. We stayed from 29th Dec 2018 to 9th January 2019. It was our first time in Whistler. There were 7 of us staying: 4 adults and 3 children. The four bedrooms and four bathrooms of which two were ensuite were perfect. The two separate lounge areas (one with the fire place and another one upstairs) ensured that everyone could have some quiet moments. There were also a TV in both master bedrooms and in each lounge. Furthermore, there was a separate laundry room with a washing machine and dryer which made it very easy to keep up with the washing! The house was beautifully decorated and had everything we required for our stay (including full cutlery, crockery, pots and pans, cooking equipment, bath towels). It was great to have the fireplace on our return from skiing. We were always warm and cosy, and appreciated the heated bathroom floors. The host, Tom, has been a wonderful person to deal with. He always answered all our queries promptly and was a reliable, honest and trustworthy person. He came on our first day to introduce himself and ensure we had everything we needed. He also contacted us once during our stay to get our feedback on the accommodation. The only suggestion was to have spare towels for the hot tub. The next day, he brought us 6 extra towels! The location was also ideal as there is a free bus shuttle stop in front of the property. It took us 5 minutes to be on the slopes in the morning which was ideal for the youngest of the kids (7 and 9 year old). We drove to the village to do our shopping at IGA, however, but the walk to the village was only about 15 minutes. If we are going back to Whistler, we would definitely rent this property again. It worked so well for our two families!!! It's a pleasure for us to see that our guests had a good experience during their stay at our townhouse. The location was amazing for us and Tom was super helpful. The condo was amazing for us - we could get to Whistler village and skiing quickly and in the afternoon get in the hot tub and in the evening hangout as a family. Had everything that we needed! Gorgeous, convenient and very comfortable. Just a wonderful place to stay in Whistler-Blackcomb. Tom couldn't have been more helpful with tips before our trip and questions that came up along the way. The condo is beautiful, very well equipped and was extremely comfortable for our family of four. We'll certainly stay here again if we're lucky enough to be able to come back to this beautiful part of the world! Walking Distance Location: Elegant Hotels, Chateau Whistler and Four Seasons Whistler, shops and restaurants are 400 yards (meters) from the townhouse. A free shuttle bus to Whistler attractions stops in front of our development. We are located in the exclusive Blackcomb Benchlands area. This quiet residential area has a pedestrian trail system which makes a short walk to restaurants, shops and Whistler's night life. For winter or summer vacations, our penthouse townhouse is walking distance to: the Chateau Whistler Golf Course, the Chateau Whistler Spa, Whistler Village, summer swimming in Lost Lake, parks and numerous trails for cross country skiing, biking, jogging, and hiking. Reservations are secured with a 25% deposit. The remainder of the rental is paid 30 days ahead of arrival. There is a 15% sales tax on rentals. If there is a cancellation, a $25 transaction fee will be applied.